Wow! I have NO idea where the year went, but here we are 365 days after my very first post at LauraLovesFitness.com. It’s been a wonderful ride so far and I’m excited to see where the blogging adventure leads to in the days ahead. Since July 11th, 2011, I’ve published 149 posts on topics ranging from key concepts in core training to the power of positive thinking and the importance of taking care of our mental health while focusing on our physical fitness. There have been express workout routines, music lists, interviews with icons in fitness and show biz, lo-cal cocktail recipes and reassurances for why it’s okay to take a day off from the gym AND indulge in a cupcake once in awhile. Whether I was sharing my reasons for loving everything from small group training to Tabatas or offering a personal account of why you shouldn’t ignore warning signs like pain and severe fatigue, I wrote each and every post with the same purpose: to motivate people to take better care of themselves. Not everyone likes to exercise. Not everyone wants to choose celery sticks over cheesecake. 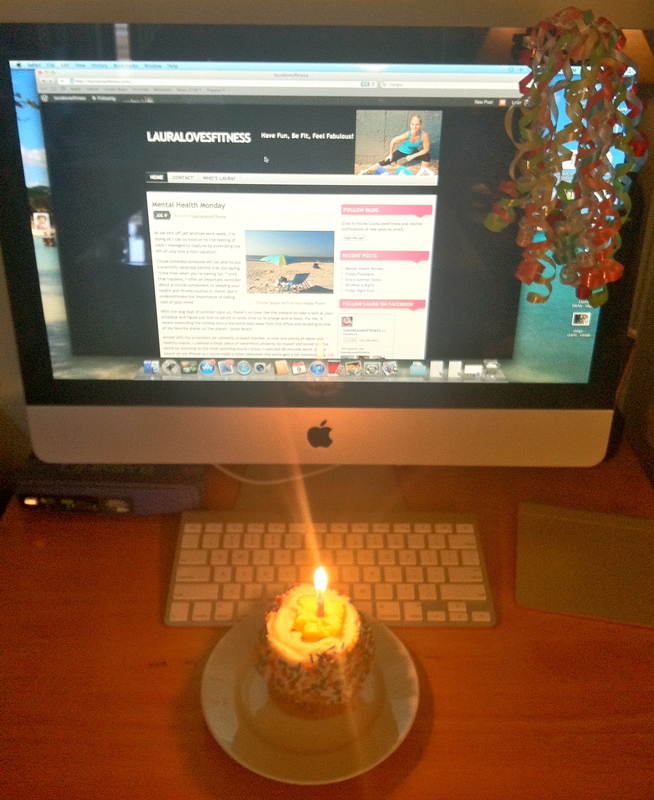 Yet, if I’ve inspired just one person to go out and find some sort of physical activity that makes him or her feel good or pack frozen grapes instead of chocolate covered ones for that trip to the beach, that’s all I need to truly celebrate my blog’s first birthday! Why I can’t believe it took me until this year to discover Zumba! Of course, I can’t let this special occasion go by without saying thank you for the support from my family, friends and all my readers. Whether you signed up for a subscription on day one or stop by occasionally to leave a “like,” post a comment or question, I appreciate anyone who takes some time out of a busy day to check in. Moving forward, I’d love to know which topics you’d like to read more about as well as the ones you’d prefer to see less frequently. I’m also using this as an opportunity to invite fellow bloggers to appear as guests on this site. (If you’re interested, here’s a link to my contact information.) Sharing knowledge in different areas of expertise in the world of fitness, nutrition and overall health and well-being can only help more people on their journey to have fun, be fit and feel fabulous! Welcome to yet another Workout Wednesday! The last few weeks, I’ve been focusing on some pretty intense exercises that get my heart racing courtesy of my small group training class. For today, I decided to shift gears to address what should be a key component in everyone’s exercise regimen regardless of his or her fitness level: flexibility training. Click here for a reminder on why we all need to make more time to incorporate stretching into our daily routines. Every stage of flexibility training – corrective, active or functional – incorporates one common denominator: self-myofascial release, or SMR. My NASM textbook defines this stretching technique as one that focuses on the neural system and fascial system in the body. Here’s a video where I demonstrate how SMR works on one of the most common problem areas – those aching calves! I’ve said it before, and I’ll say it again: if I could go back in time and change one thing about my life-long love affair with fitness, it would be to incorporate much more flexibility training into my routine. It’s truly one of the best things we can do for ourselves in order to have fun, be fit and feel fabulous!